Ultrasonic flow meters measure, via sound waves inaudible to humans, the velocity of fluid flowing through a conduit. The conduit can be a recognizable closed piping run, or open channels, flumes, or chutes. The technology is predominantly applied to liquids and gases. There are three types of ultrasonic flow meters, differentiated by their means of measurement. An open channel flow meter derives liquid depth by computing geometrical distance, combining it with a velocity measurement and known dimensional properties of a flume or other channel. A Doppler shift flow meter reflects ultrasonic energy off sonically reflective materials and measures the frequency shift between emission and reflection to derive a fluid velocity measurement. 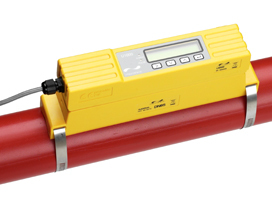 The contrapropogating transit-time flow meter, more recognizably, the transmission flow meter. The transmission flow meter has two versions: the in-line and the clamp-on. The in-line configuration is intrusive, with flow meter hardware extending into and exposed to the measured media. A clamp-on style ultrasonic flow meter resides on the outside of the pipe, emitting and receiving the ultrasonic pulses through the pipe wall. These process measurement tools, using ultrasound technology, have the ability to measure fluid velocity and calculate volumetric, mass, and totalized flow. The use of ultrasonic flow measurement is prevalent in the oil and gas, nuclear, wastewater, pharmaceutical, and food and beverage industries. It is also employed in energy management systems as a means to measure energy demand. For externally mounted flow meters, a clamp-on device affixes the flow meter measurement elements to the pipe. One special characteristic of clamp-on flow meters is the ability to transmit ultrasonic signals through piping up to four meters in diameter, making them suitable for application in very large systems such as those found in hydroelectric or wastewater installations. The clamp-on arrangement also facilitates addition of a flow measurement point to an existing system without process interruption. The technology is pervasive in the processing industries, having its particular niche of applications where it excels. Proper installation is a key element in producing reliable and consistent results. Ultrasonic energy flow technology is used for custody transfer of natural gases and petroleum liquids. Custody transfer usually entails following industry, national, and government standards and regulations. Other popular applications include compressed air system monitoring and energy usage metering. Ultrasonic flow meters, with no moving parts, are comparatively low maintenance and self-diagnosing. Temperature and pressure measurements are needed to calculate mass flow of gases. When measuring liquid mass flow in pipes, it is generally necessary for the pipe cross section to be media filled in order to obtain reliable results. Whatever your flow measurement challenge, share it with a process measurement specialist. Combine your process knowledge with their product application expertise to develop effective solutions.